1390 John was crowned emperor by his father, Andronicus IV, at the height of his hostilities with John V. Both of them would die leaving him as antagonist to Manuel II, who happened to be his uncle. But it was a very lopsided antagonism for Manuel was a grown up and quite well-loved by his people while John VII, at least early in his career, was just the puppet of the Turkish Sultan Bayezit. While in Bayezit's court he served as little more than fodder to fuel the enmity between the two great rivals. In 1390, the Sultan managed to effect a coup d'etat by slipping John VII into Constantinople and deposing John V with the help of a few sympathizers. Unfortunately for him, Manuel who remained loyal to his father throughout, managed to get some help and, a few months later, reversed the situation by getting John VII off stage and replacing the elderly John V to his rightful throne. For the next several years uncle and nephew remained estranged over the fiasco. However, several years after Manuel had succeeded John V he saw it necessary, in light of a protracted siege by Bayezit on Constantinople, to leave the capital in an appeal for help from the various nations of Europe. Seeing that if he left without putting someone in charge during his absence it would invite pretenders to contest the throne, Manuel bit his tongue and recalled John VII who had been cast off to Selymbria, a small city about 30 miles west of Constantinople. The two patched up their differences and Manuel crossed his fingers, hoping that John VII wouldn't pull any dirty tricks while he was out of town. Surprisingly, John behaved himself and ruled competently (though only as regent, not co-emperor) for nearly four years before Manuel returned. When Manuel did return he graciously stepped down without so much as a huff. Later on they had another short-lived spat and Manuel banished him to an island but, whatever the reasons for this, Manuel recognized the good of his nephew and suspended this punishment just a short time later and finally rewarded him for his efforts with the imperial title and rule over Thessalonica. He died, however, in 1408 of natural causes. 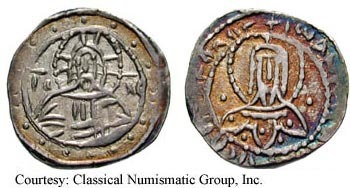 SB 2562 AR Half Stavraton Obv: Nimbate bust of Christ facing. Rev: IWANICBACIО› VCOО AО› OО›OО“OC - Bust of John.